SURROUND PASSIVE VOLUME CONTROLLER AUDIO MONITOR CONTROL. CLASSED AS B-STOCK, SOME SCUFFS OR MARK MAY BE EVIDENT. Designed to provide true passive analog control over surround studio monitoring systems the MPatch 5.1 employs a newly designed multi gang passive switching system with incredible accuracy which in the past would have only been posible in units costing 1000's of dollars. No power has to be connected to the MPatch 5.1 in order for the unit to opearate, the power is only needed for LED indication, it is a totally passive surround controler. A 25 pin D-SUB input connector provides six surround (5.1) and two stereo input channels. In addition to a surround speaker system, a stereo monitoring pair can be connected to the MPatch 5.1. An additional 4 stereo input allows for other unblanaced line level input to be connected to the MPatch 5.1 (such as DVD players, CD players etc). Adjustment of the attenuation in the MPatch 5.1 is handled by a 12 gang switching system utilising accurate precision metal film resistors which eliminates issues currently found in other passive systems at lower volumes. Dual Balanced XLR L/R outputs. Rotary analog stereo volume controls. 8 output selector switches with mutes. The item "SM PRO M-PATCH 5.1 SURROUND PASSIVE VOLUME CONTROLLER AUDIO MONITOR CONTROL" is in sale since Thursday, May 24, 2018. 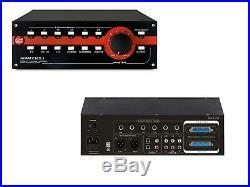 This item is in the category "Musical Instruments\Pro Audio\Signal Processors/Rack Effects". The seller is "re_act" and is located in Gosford, NSW. This item can be shipped worldwide.